Make a statement with Franklin Mills custom real estate & title company portfolios! Make a statement with current and prospective clients by presenting important documents and information in a professionally designed Franklin Mills portfolios/kits. Factory installed vinyl pockets can hold business cards. Portfolios can be designed to hold standard legal and letter size documents and different sized materials including popular CDR and DVD media formats. 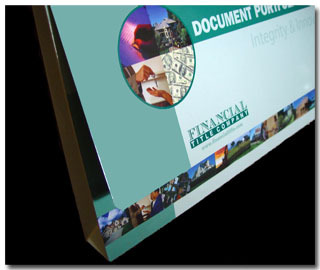 Real estate and title document portfolios can include custom printed divider inserts separating sections of the kit. Real estate & title companies can enhance corporate image and client confidence by presenting documents in a professional and organized portfolio by Franklin Mills. 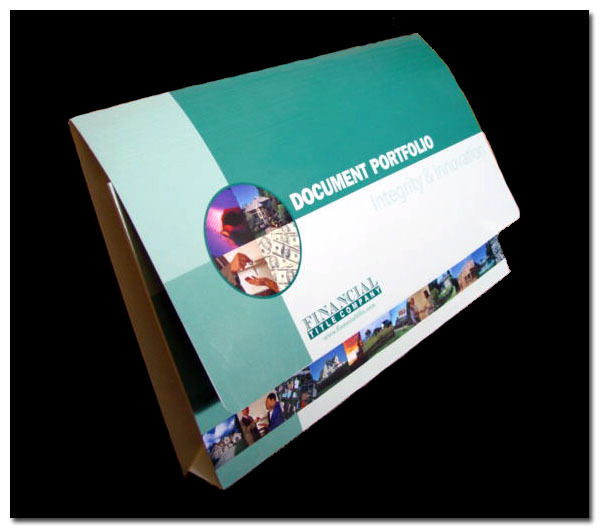 Make a statement to prospective clients by marketing your company with style in a custom-designed portfolio/kit. Contact the experts at Franklin Mills for assistance in designing your document portfolio at 1-888-678-4585.